Robert Lester Gochnauer, DVM, (Dr. Bob), 68, of Hamptonville NC, formerly of Massilon Ohio returned to the Lord on Wednesday May 10, 2017. He was born to this life on April 29, 1949 to Lester and Isa Gochnauer of Orville, OH. Bob went to Waynedale High School and then to undergraduate at THE Ohio State University followed by The College of Veterinary Medicine from which he graduated in 1975. After veterinary school he completed a large animal internship at The University of Pennsylvania, New Bolten Center. He is survived by his beloved wife of 43 years, Dr. Karen Karaffa Gochnauer, son Adam Michael Gochnauer, daughter Dr. Mary Kathryn Gochnauer, son Daniel Lee Gochnauer, sister Sue Gochnauer, brother Ronald (Kathy) Gochnauer, nephew Ryan (Colleen) Gochnauer, and niece Kellie (Joe) Sterling. He was preceded in death by Lester and Isa (mother and father) and brother Rick Gochnauer. 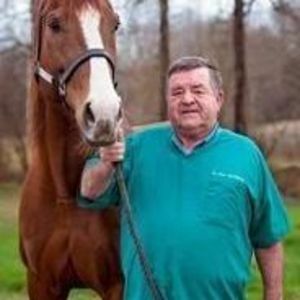 Dr.Bob was a lifetime member of the NCVMA, AVMA, American Association of Equine Practitioners, American Association of Bovine Practitioners and received numerous awards and accolades for his expertise in veterinary medicine to which he dedicated his life. Dr. Bob's life reflected his commitment to serve his God, family, animals, and people through veterinary medicine. He never put himself first but always went when and where he was needed. He impacted the lives of many animals and people through his 42 years in veterinary medicine. He is a healer. Although he will be missed, none will miss him more than his family. We love you Dr. Bob. Calling hours will be Monday May 15th from 4-8PM at Bunch Johnson Funeral Home, 705 Davie Ave, Statesville. Service of Christian Burial will be celebrated at 11AM Tuesday May 16th at Grace Covenant Church, Cornelius. Burial will follow at Oakwood Cemetery in Statesville. In Lieu of flowers, donations can be made in his honor to Samaritan's Purse P.O. Box 3000 Boone, NC 28607; Grace Covenant Church 17301 Statesville Rd Cornelius, NC 28031; St. Stephen Endowment Fund 101 Hawthorne Rd. Elkin, NC 28621; Heifer International P.O. Box 8058 Little Rock, AR 72203, or charity of choice. Letters of condolences can be sent to the family at www.bunchjohnsonfuneralhome.com. Bunch-Johnson Funeral Home is honored to be serving the Gochnauer Family.